Some interesting discussions going on this week about Social Business, Yammer being bought by Microsoft one of them. Until now I really haven’t given my opinion on it even though I was asked about it by several people as I have been blogging a few times about Yammer before and have been specifically looking at it for it’s possibilities of extending Sharepoint, one of the platforms on which we actively sell services and solutions. But not just about the Yammer/Microsoft move but also in respect to what this could mean to IBM Connection. IBM’s social platform that has been a major focus for me professionally over the last few years. First of all, I think Microsoft did a really wise move buying Yammer. I think someone in Redmond finally realized that just calling Sharepoint a collaborative ‘social’ platform doesn’t make it one and that they really had to take some bold moves to catch up as others like Jive and IBM were miles ahead there in the social business arena. Secondly I think Yammer can benefit from this as well. As I said before I believe Yammer has one of the best social conversation streams in the Social Business arena right now and their way of bottom up adoption is innovative and effective in getting new users, but their collaboration options (file sharing, activities, communities) just aren’t mature yet and on that end it was missing out and in need of some serious investment. So combining Microsoft’s capital and Sharepoint’s collaborative content management with Yammers capabilities in getting the social conversations going, I think, could benefit both. Especially as this is already being done. Integrating Yammer in Sharepoint isn’t something new, it is already there. This move will only embed Yammer into Sharepoint even more. So what does this mean to IBM Connections and to Microsoft’s competitive position on the Social market? Will they take Yammer as is and just make the already existing integration stronger? Yammer right now is a cloud based product. Will that appeal to customers who deliberately chose for on-premises installs? Will they incorporate the Yammer data into Sharepoint? A big downdraft I see with the existing Yammer/Sharepoint integration is the fact that the conversation is separated from the content. The document, file or workflow being in Sharepoint and the ‘conversation’ and social content about that document, file or workflow being in an externally hosted social environment. Maintaining integrity and consistency of data with a model like that over time and during the contents lifespan can be a big challenge. And lastly…. Will Microsoft allow Yammer to fully incorporate into Sharepoint allowing the social knowledge Yammer has to embed itself into the more document oriented current Sharepoint environment or will it remain a little new playfriend on the sideline? From the communications right now it seems Microsoft is keeping Yammer as a separate entity within it’s portfolio and not blending but integrating it into the other product streams, not bad from an innovation stand point but not beneficial to Sharepoint either which is in desperate need of some ‘social understanding’ influx. So what does all this mean to IBM Connection? Well, for now little I think. Of course, Microsoft will use this to strengthen its position on the social market and give some footing to it’s claims of being a social platform provider. Rightly so, it is taking steps. But to really leverage Social Business I think it needs to do more. It needs to start thinking as a social business. And that is exactly where I see IBM’s strength coming through. IBM Connections wasn’t created as a platform to fill a gap for a new hype, it was designed from personal experience in becoming a social business, living an ideal and experiencing it’s challenges and pitfalls as IBM itself was becoming a social business. It was build on experience and is focused on getting people to leverage their strengths to grow as an organization by collaboration and participation. To say it bluntly: It’s not just about starting a conversation, it’s about getting that conversation to turn into collaboration and therefore to start generating revenue. Yammer was well on its way to build a truly collaborative social environment over the last year and a half or so. So if this move from Microsoft is going to succeed depends, in my eyes, solely on how much of this Microsoft really gets. Personally I hope Microsoft will recognize it and use the knowledge and social strengths of Yammer to, for lack of a better word, “infect” it’s organization and Sharepoint development with the social bug. Or, better yet, build out Yammer to eventually overtake Sharepoint (I know a bold thing to say!). The market for social business is booming and the combination of Sharepoint’s market with Yammers social aptitude has enough potential to grow into a major player. But I also think Microsoft still has a few steps to take before they truly ‘get it’. After all, social isn’t just a tool to be bought, it’s a mindset and requires a major culture shift, and on those IBM can still teach Microsoft a lesson or two I think. Yammer: a wolf in sheep's clothing? 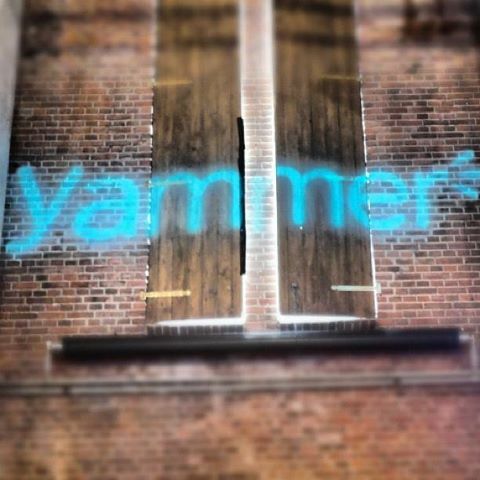 Last week I talked about visiting the Yammer on Tour (YoT) event in Amsterdam. Somehow it is still playing my mind. Not that I changed my mind about it but mostly because I’m wondering why it is so popular among the Dutch. If the announced number of 500.000 payed Yammer accounts in The Netherlands is right that would mean Yammer has a more than substantial penetration of the Dutch labor market of about 8.5 million… A penetration most software providers would kill for and more importantly one obtained without much marketing. So why is Yammer so popular here? First of all I think the Dutch are very outgoing and adopt social tools at an incredible speed because of that. Having an opinion and speaking your mind is something that is embedded in Dutch culture and taught from a very young age. The whole social revolution just taps into that. Something that is clearly visible with the adoption of all social platforms, not just Yammer. But there are other factors here too I think. As Yammer doesn’t really need any IT department involvement to be kick started within an organization (anyone can just start a company community free of charge) you see a lot of instances where adoption is done bottom up. IT is not involved until a large part of the organization is already using it and is therefore put on the spot. Seeing it being used and accepted and not having had any time to investigate the need or workings for such an application they simply go with it and more or less accept it as is. All the factors and barriers that would otherwise have had to be passed in a software platform acquisition process are suddenly completely bypassed. Yep, it isn’t nice to say about my own fellow country men but I feel gullibility plays a big role here too. I don’t know how it came to be but at a certain point some government institutions started using Yammer for their internal social communications. It didn’t take long for more to join, and more and now several really big and important governmental institutions are using it. Institutions that are handling highly sensitive personal and financial information. The Dutch in general put a lot of trust in their government so other companies seeing this and thinking “Well if they use it it must be safe” joined in and before you know it you’ve got a lot of companies seeing this as a perfectly safe option. Now don’t get me wrong, I’m not saying it isn’t or that non of the organizations really investigated it. But I do get the impression a number of them really didn’t look into it too hard. The idea of information, in this case possibly even my personal information being discussed and shared over Yammer servers located in the US with the US data security regulations – regulations we all know do not necessarily comply with EU legislation – makes me twitchy at best. And as Yammer stated themselves, they are not planning to open any EU data center for the foreseeable future…. How delicate this is was demonstrated when at YoT someone, working for one of the these government institutions got up and asked “How do we control that information shared on the Yammer network stays compliant with the information in our regulatory systems, as we want to make sure our people are consistent in their communications to the outside world when using information obtained through Yammer?“. The answer was (correctly) “Yammer is not for sharing the information but only sharing the location where it could be found“. The fact this question was asked though already shows that this really is an utopia. I do believe that most people at all these institutions are probably using it responsible, but at the same time I can’t help but wonder if this isn’t just a short way out for a lot of these companies and institutions. They see the need (and yes, there definitely is a need for social business here in The Netherlands) and jump in at the first option they see swimming by. If that really is a feasible option though remains to be seen. Yammer seems to be mostly a Facebook like tool and doesn’t offer much more then a really nice way to start the internal conversation. Social business though is about more than that and gets its real value from collaboration. Something Yammer in my eyes still falls short at. Not to mention the problems they could get themselves in for not complying with EU privacy act regulations…..
Not surprisingly thus that some of these major institutions, recognizing the sensitivities and lack of collaboration, are now turning to other tools like IBM Connections to handle their social business needs. How the smaller ones will fare though remains to be seen. It isn’t easy changing social platforms once you’ve chosen one. Yesterday I attended the Yammer on Tour business event in Amsterdam. Advertised as “an interactive, educational and fun event to learn how to harness the power of Enterprise Social Networks“. As my knowledge about Yammer was fairly limited and I’m always interested in anything having to do with Social Business I saw it as a perfect opportunity to see what Yammer is and what it can do for an organization. They definitely got the buzz right. Over 300 people attended and there was a definite vibe. Trying to find out what Yammer can do it all kept going back to the main focus; the message feed. Now I’ve got to hand it to them, they’ve got that part right. It’s easy to navigate, has algorithms to surface important and relevant conversations and allows for things like @-mentioning. Something I think is really very important for making real and collaborative conversation possible. The one thing I was missing though was collaboration. Yes they have ‘Files’ where you can share files, have some versioning and comments, but it almost seems to hang on….not knowing what it’s position is in the overall configuration. Similarly they’ve got Pages. Text documents that you can work on simultaneously with groups of people, co-authoring it on the fly. Again, nice but very limited and the result is not an actual document but a page posted to Yammer.So using it to work on a real project proposal or a spread sheet is out of the question as it’s only basic text with some very limited formatting (bold, underline, italic,indent, strike-through and bulleted lists). Yammer to me, is all about the conversation but still has a long way to go for the collaboration. One of the slides shown was that of actual registered users.Apparently Yammer right now has about 4 million paying users, half a million of which are located in The Netherlands alone. Making it their top market right after the US. Still they do not support, or have plans in the foreseeable future, to host data centers in Europe (as stated by David Sacks,CEO of Yammer on being questioned about this). Something I think could really hurt them in the end as EU data&privacy laws are increasingly bogging down on privacy data security. As part of the event a showcase floor was set up with stations around the room for people to see what Yammer & partners can do. Out of approximately 15 stations only 3were from partners selling software that connects with Yammer and all of those were more or less just pushing notifications into the activity stream. All other stations were desks manned by Yammer employees. It did make me wonder how well connected it really is. On asking I got told that up till now there is no interaction model. It’s simply feed updates that are being pushed into a object model. So even though the notification gets into the activity stream, any actions with that data (even a simple workflow) will still take the user out of Yammer. Right at the start of the event I was sitting next to someone who has been advising Yammer to customers and training them. He told me quite frankly he loved Yammer, but not on his mobile as the mobile apps were crap. Low and behold, one of the presenters asks the audience to participate in an little demonstration by life editing a page he has up. Of course I try thisin the iPad app but simply can’t find the page. It turns out the mobile apps don’t support any of the other features apart from showing the feed. For other functionalities one has to rely on a browser. Now that’s mildly ok on an iPad, but on a phone…. I was not surprised to see no more than 4 people out of a 300+ audience actually partake in that little demonstration. Yammer clearly has a long way to go there to fully leverage the ‘Mobile’ idea. Another interesting discussion I had was with a Sales representative who I asked about the sales model. Apparently an enterprise license is $15 a month a user. Now for that privilege you get the right to setup an unlimited amount of premium external facing communities (based on a mail domain or general) with up to 100 users each. So when I asked him: “Ok, so when I set up a mail domain with 2 users, register that for an enterprise license a30$ a month, I then have the ability to set up a community for my 100 man strong company for free?”.… ‘ehh..yes’. “And will it do the same as the registered community?”.… ‘yeah’. “So why would I buy a full license at 1500$ a month then if I have less then 100users?!?”…. ‘ehh’. I can’t really get my head around that business model yet. Overall I can say, I liked what I saw. They’ve got the interface spot on. Clean, very ‘Facebooky’. Easy to navigate and understandable to users with limited knowledge of social networks. They’ve really build an impressive internal social stream system. But to me that is it. As a collaboration tool it still has a long way to go. The thing that really impressed me though about Yammer is the way it is penetrating the market. Their idea of offering anyone the freedom to set it up, free of cost and without requiring or assuming any ‘managing’ responsibility means that it is penetrating organizations from the bottom up and with an ease that is unprecedented. Instead of having to go through IT or management, employees can now initiate this completely on their own….. and they are doing it. Inviting and enticing co-workers as they go. I talked to or heard of at least 5 Line of Business managers at the event that were introduced to Yammer not by their IT department or management but by their staff who had already started using it and then simply invited them. All of them felt they couldn’t ignore it and where there to learn more about it. So interesting tool and certainly one to keep an eye on!